Temperature Sensor in Electro Permanent Lifting Magnet - Armstrong Magnetics, Inc.
More and more people prefer to use electro permanent lifting magnets for handling hot steel parts on flame/Plasma cutting table. With the extension of working time, the lifting magnet would absorb more and more heat from the hot steel parts lifted and its temperature would increase higher and higher. If its temperature exceeds a certain value, the lifting magnet could be damaged. 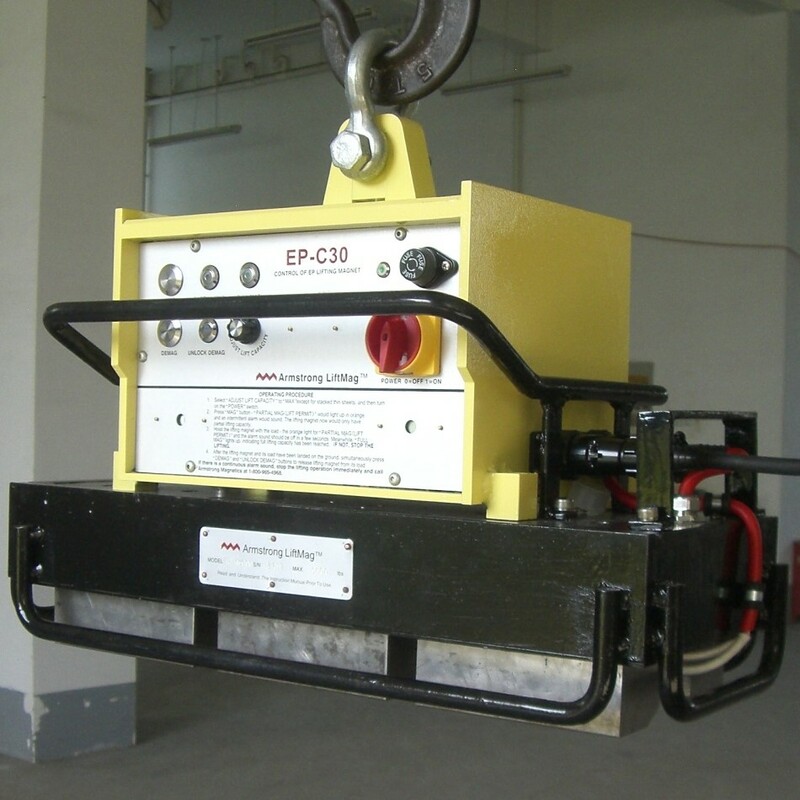 Any electro permanent lifting magnet design has been installed with some heat sensitive components or materials, such as Neodymium magnets, potting Epoxy and coils of enameled wire. These materials and components have their maximum working temperature limits respectively. At a working temperature higher than its maximum, the materials or components could be damaged by a certain degree, therefore reducing the lifetime of magnetic steel lifter. In order to remind operators to stop operating the electro permanent lifting magnet just before it reaches close to its maximum working temperature, we install a high temperature alarm system. The system has a temperature sensor installed at a magnetic pole detecting the temperature of the pole. When the pole reaches a preset value, an alarm would sound in a specific tone. This high temperature alarm system itself does not switch off electro permanent lifting magnet, it alarms sound only when the temperature is higher than a limit. While the alarm sounds, the operator would have to switch off the equipment at the lifting magnet controller. The operator would be able to switch on the electro permanent lifting magnet again until it has been cooled below a preset low temperature limit.